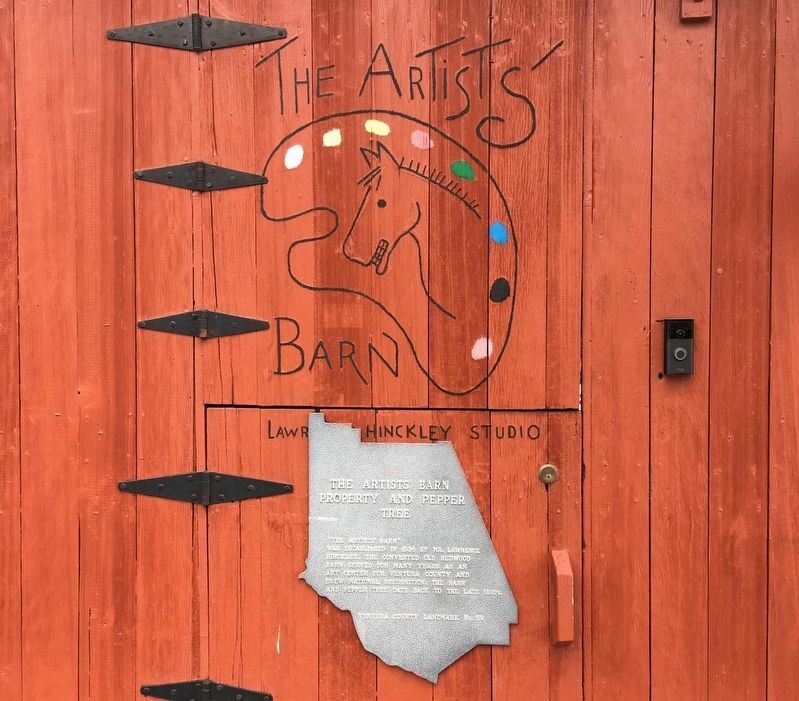 “The Artists Barn” was established in 1936 by Mr. Lawrence Hinckley. The converted old redwood barn served for many years as an art center for Ventura County and drew national recognition. 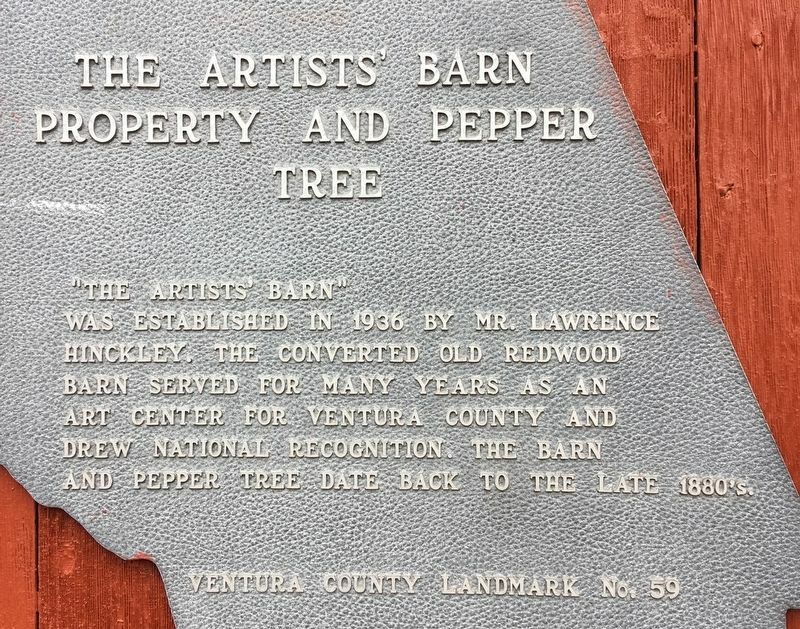 The barn and pepper tree date back to the late 1880s. Location. 34° 24.214′ N, 118° 54.757′ W. Marker is in Fillmore, California, in Ventura County. Marker is on Bard Street west of Saratoga Street, on the left when traveling west. Touch for map. Marker is at or near this postal address: 416 Bard Street, Fillmore CA 93015, United States of America. Touch for directions. Other nearby markers. At least 8 other markers are within walking distance of this marker. 364 Central Avenue (approx. 0.2 miles away); 362 Central Avenue (approx. ¼ mile away); 348 Central Avenue (approx. ¼ mile away); 340 Central Avenue (approx. ¼ mile away); 338 Central Avenue (approx. ¼ mile away); 328 Central Avenue (approx. ¼ mile away); 320 Central Avenue (approx. 0.3 miles away); Fillmore State Bank (approx. 0.3 miles away). Touch for a list and map of all markers in Fillmore. Artists' Barn and Surrounding Grounds, Including Aged Pepper Tree (aka Hinckley's Artists' Barn) Built c. 1910. Designated July 1980. 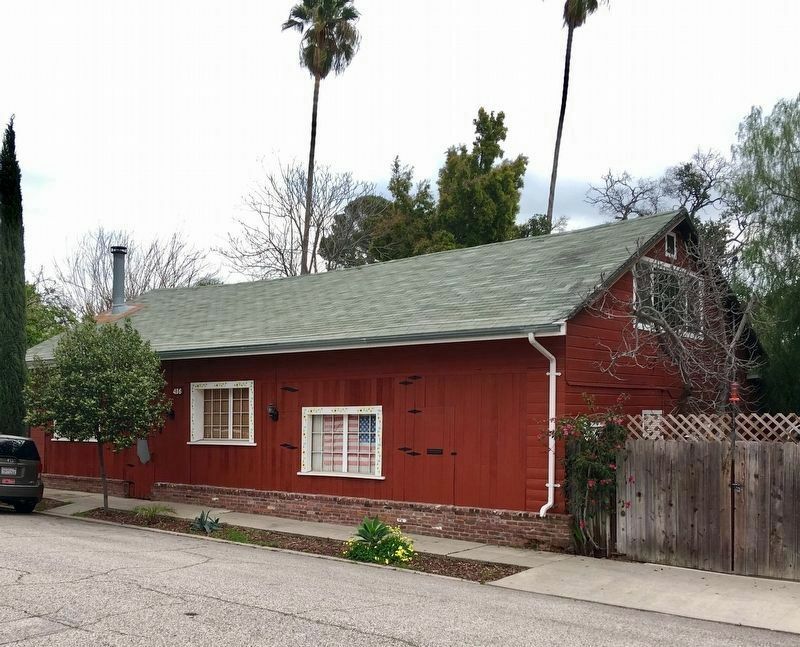 For many years the Hinckley's Artists' Barn, which was converted from a barn to a residence and studio in 1936, served as an art center for Ventura County. It was featured in a Life magazine article in 1936. One wall, called The Famous Artists' Wall, has 10-inch squares that were painted by professional artists who visited the site. When there was no more room on that wall for distinguished visitors' paintings and signatures, the squares were continued across an adjacent wall. The barn regularly served as a Lyceum of the arts. A pepper tree on the grounds was over 100 years old when the landmark was designated. The old pepper tree is gone. The marker can be seen on the left, below the small tree. More. Search the internet for The Artists’ Barn. Credits. This page was last revised on March 25, 2019. This page originally submitted on March 24, 2019, by Craig Baker of Sylmar, California. This page has been viewed 48 times since then. Photos: 1, 2, 3. submitted on March 24, 2019, by Craig Baker of Sylmar, California. • Andrew Ruppenstein was the editor who published this page.